This frozen dessert is so fragrant and so easy to make: the ingredients are just whipped together and frozen and it doesn’t need churning. 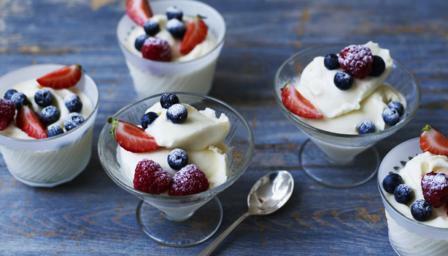 Serve with summer berries for the perfect summer dessert. Place the cream in a mixing bowl and whip until it forms soft peaks, then gradually pour in the elderflower cordial, whisking until combined. Transfer to pretty little dessert glasses or Martini glasses for at least three hours or overnight in the freezer. To serve, place in the fridge for 15-20 minutes to soften slightly, then serve each glass with a few summer berries and decorate with a dusting of icing sugar.